Questions about the ONE Campaign? Please fill out the form below and we get in touch with you shortly. We look forward to speaking with you! 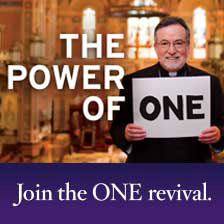 In the next few weeks, we will begin to hold receptions at parishes around the Diocese to introduce the ONE Campaign. You should receive an invitation to this parish event soon but please submit your name, email and parish info below, to be notified by email as well.